This is the time of year where every real estate site and agent is posting their 2011 real estate market forecast. So, we thought we would do the same. Our thoughts on next year’s housing market will not come as a surprise to our long-time readers, as we are constantly measuring and reporting the current state of the Coeur d’Alene real estate market for our readers and clients. And for those of you involved in real estate as your business, we are sure you already have that gut feeling about what we are going to say. We have projected and reported falling home values in Kootenai County for the past three years. We will continue to do so now for certain sectors of the market in 2011. While it is no fun to be the bearer of bad news, we think it is important to have a great understanding of the Coeur d’Alene & Sandpoint, Idaho housing market if you are buying or selling anytime soon. Like any time of NORMAL real estate activity, there are good signs and bad signs and you just need to take the information we give you and formulate your own opinion about what 2011 will bring for home buyers and sellers. One quick way to see what is going on in the market is to study year-over-year results for home sales. Did we sell more in November of this year compared to November of last year? How does 2010 compare YTD to 2009 or 2008 YTD? This is great trend information that let’s us know the current state of the housing market. 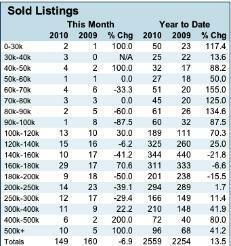 Looking at the data, it is pretty simple to say there is a dramatic improvement in home sales in 2010 over 2009. With an overall increase in sales of 13.5%, it is clear we are on the right track. Nearly every price point in the market experienced gains except for the 140-160k and 180-200k price points. However, it is important to note that those two price points were undoubtedly affected by the $8,000 tax credit that expired earlier this year. Buyers more than likely rushed out in late 2009 and early 2010 to take advantage of that credit thus pulling sales forward that would have likely occurred later in the year. If it weren’t for the tax credit, we probably would have seen gains in those areas as well. The next indicator that should give us a glimpse into our near future is the inventory and demand for housing in Coeur d’Alene and Sandpoint. Simply looking at the inventory for our market (the bars in the graph), it is clear there are also signs of improvement. 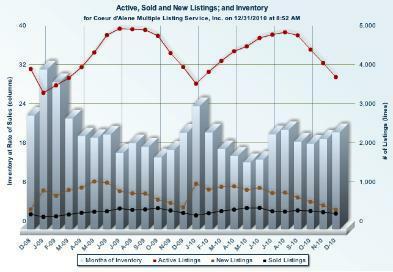 Year-over-year, inventory is steadily declining while sales are slightly increasing. This is a good sign; however, there is still too much inventory for the current demand in the market, thus prices will continue to decline in the coming months. Foreclosures, tighter lending standards and jobs. In the year 2011 there are four more waves of adjustable rate mortgages (ARMs) whose interest rates are set to adjust upwards from their low teaser rates. They are the ten year ARMs from 2001, the seven year ARMs from 2004, the five year ARMs from 2006, and there are even a few three year ARMs from 2008. This will be in addition to the four waves of arms that reset in the year 2010 and many other types of creative financing better known today as “toxic mortgages.” As these loans all go delinquent and sell as foreclosed homes, it will continuously pull down the value of real estate no matter what. This will go for most any part of the country. Simply put, there are still foreclosures to come in 2011 which will bring prices down. As more and more homes go into foreclosure, the financial institutions will have no choice but to continue tightening their lending standards. This means they will require even higher credit scores, better credit reports, bigger down payments, higher fees, higher insurance premiums and much more in order to qualify for a mortgage. This is going to further limit the pool of potential homebuyers. Unemployment will continue to be an issue for the housing market no matter where you live. As people remain out of work, foreclosures will go up and less people will be buying homes than there would normally be. The less people there are working, the less money that flows into the economy which directly influences the housing market. We discussed the good signs and the negative factors that will influence the housing market in 2011. The question is, which will be more powerful? Any way you slice it, we think nearly everyone will agree that the first quarter of 2011 will be a difficult time in the market. Sure sales are stabilizing and inventory is decreasing, but it isn’t happening fast enough. In some sectors of the market, it is safe to say there is a bottom. In others, however, we still have a ways to go before the numbers are convincing. The smart buyers, however, will see the first quarter of 2011 as the best opportunity to buy. As one of our closest friends once said to us, “I am not interested in all the fluff, just give me the meat and potatoes.” So, friends, here it is: Prices will continue to decline in 2011 primarily driven by the second home market and properties priced over $500,000. Vacant land will continue to be soft as buyers will still be able to buy built product for under replacement value and financing remains difficult. Sales will continue a slight increase, primarily occurring in the summer months and into the fourth quarter. The “smart money” is returning to the market with developers and buyers with cash looking to take advantage of well priced properties. Foreclosures and unemployment will continue to be a drag on the housing market. Waterfront properties and water view properties will continue to lead the sales in the second home market. Inventory overall in 2011 will likely fall due to a lack of new construction. 2011 will be the year of the bottom with growth coming in 2012. For many, the American Dream is now becoming reality because of the events in recent years. This is good news for the generations entering the housing market and for the Baby Boomers who are also coming into the market and looking to downsize or buy the home of their dreams. The incredibly low interest rates and great buys around the area make this a very good opportunity to buy. We already have closed sales for 2011! We have proven strategies to help you buy or sell your property in this market and economy. Call us today to find out how we can put this information to work for you in 2011 and beyond. 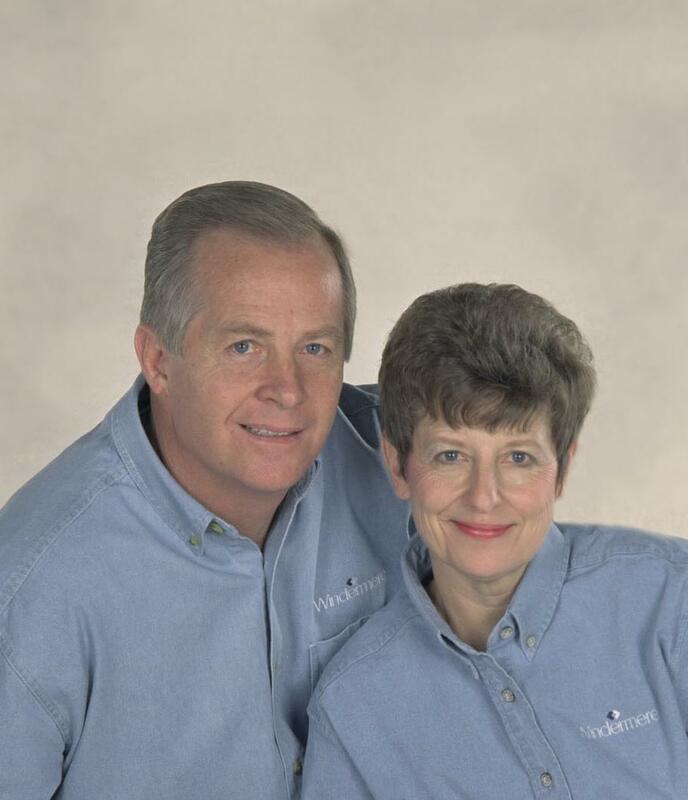 Contact Randy & Christy Oetken today! ~ by The Oetken Group on January 10, 2011.